The CT scanner looks like a large donut within which a x-ray spins around taking full dimension pictures which are called “slices.” The CT scan’s computer converts these stacks of slices into high resolution three-dimensional images of the internal organs and other structures of the body. The advent of computed tomography (CT scans) has transformed medical imaging in positive ways: it provides incrediblydetailed views of the internal organs and structures in a high resolution, three dimensional images which make it a better choice than conventional x-rays. Due to it high contrast and resolution and its ability to image small structures it is able to visualize small vessels such as blood vessels in the brain, heart and body. As well as the organs, other body structures and masses. Newer CT scanners are up to 64 times faster and can take thinner, more detailed, images than older machines. For example the Multislice helical CT scanner that we use in our urgent care clinic can image the entire chest in under 10 seconds, and it has superior technical and clinical applications compared to the usual CT scanner, making it ideal to detect: aortic dissections, penetrating ulcers, intramural hematomas, aneurysms, coronary imaging, and pulmonary emboli, lung nodules, airways disease. 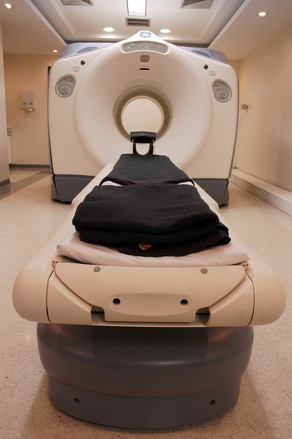 CT scans are employed when a crisp, high-resolution image is needed in a urgent, or emergent setting. For example to examine the head after a traumatic injuries, to rule out bleeding in the brain, or a fracture in the skull. CT scans can identify brain tumors, and infections. It can give clinically detailed views of the spine, including the vertebrae and the intervertebral discs and spinal cord. It can even measure bone density. Some CT scan studies require the administration of an x-ray dye either via an IV into the veins or swallowed to get a better view of the abdominal organs. CT scans of the abdomen are excellent for visualizing the liver, gallbladder, pancreas, spleen, aorta, kidneys, uterus, and ovaries and can be used to detect tumors, infection, abnormal anatomy, or changes of the body caused by trauma. CT Scans are safe. The CT scan itself produces radiation, but the amount of radiation a person receives during a CT scan is minimal. Occasionally the injected contrast dye used to enhance the CT images may cause an adverse reaction. The Intravenous contrast is composed of an iodine-based liquid and may result in itching, a rash, or hives. These symptoms are usually self-limiting and resolve on their own quickly. Rarely is treatment for these reaction needed, but if so antihistamines are used. If symptoms are severe corticosteroids, antihistamines, and epinephrine can reverse this adverse reaction. Prior to the administration of the IV contrast a blood test will be taken to test kidney function. A house call by Doctors on Call can help you determine if a CT scan is necessary and refer you to our affiliated urgent care clinic where there is are STAT metabolic panel blood tests that can be performed in minutes, hastening treatment.